A new era begins for endurance athletes at Walt Disney World in January 2014. The ever popular Walt Disney World Marathon Weekend just got a little bit bigger and a little bit crazier. In the past Disney has offered many events throughout the weekend to create a family friendly environment that encourages family fun thru movement, while also trying to cater to the crazy serious endurance athletes with longer and more grueling events. Starting in 2006 they gave athletes the opportunity to test their limits with the Goofy’s Race and Half Challenge. This “race” required participants to run the half marathon on Saturday, then turn around and run the full marathon on Sunday. Goofy, right? Absolutely! However, I have friends who are “perfectly Goofy” having ran the Goofy Challenge every year since its inception. 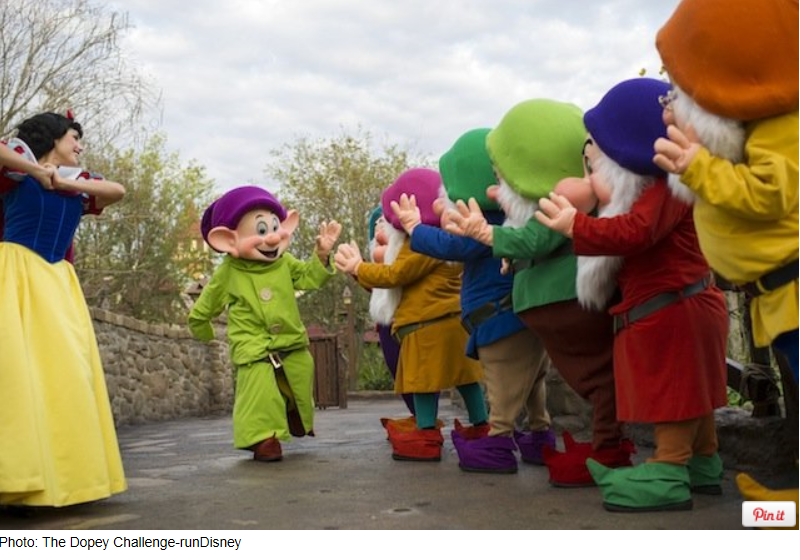 For 2014, they upped the ante and are offering for the very first time, the Dopey Challenge. Sir Dopey is a series of 4 events over the same amount of days. 5K, 10K, Half Marathon and FULL Marathon. So the real question is, are YOU Goofy or just plain ole Dopey? Apparently, I must be Dopey! This will be my first Disney race ever and I generally live by the “go big or go home” philosophy anyhow so I’ll be registering for Sir Dopey on April 9th when it opens. I won’t be “racing” the series but enduring. The plan is to run the miles, all 48.6 of them, and endure. No more, no less. This entry was posted in Running and tagged Disney Marathon, Disney Marathon Weekend, Dopey Challenge, Goofey Challenge, new race for Disney Marathon Weekend, runDisney by tootallfritz. Bookmark the permalink. You will have an AWESOME time!! Disney knows how to support a race like know one else!! The whole experience was amazing, and I ran it, but did not race it. Good Luck!! I ran just the Disney Marathon one year and I guess it was enough for me! I know some that have run that Goofy numerous times and I suspect they will go to Dopey-dom. I suspect it just would mean spending more time in money in Florida-land, and might be ok if that was the only race event I did for the entire year. Yikes…6-blings….I don’t need anymore blings to hang on the wall…LOL! One thing about Disney running is it can be a nice escape from Chicago winter! You will be smart not to race all those races and just run them easy to “endure” as you denote….and probably enjoy it a lot more than trying to run them for fast finish times. Enjoy it! I like how you said you won’t race it, but endure it. That’s exactly how you get through a crazy series of races like this. I don’t think I’ve ever run four days in a row let alone RACE in such a time period. At least the marathon is the last event — ending it with a bang! It was fun meeting you yesterday — here’s to future Chicago Runner events! Absolutely! I had fun last night. As for ending the series with a bang, yeah, I’ll be crawling to the airport begging to get on the first flight out of town. This will be a one and done for me but the story will last forever. Disney Marathon is in my bucket list. *crossing my fingers! I’m so jealous!! I would love love LOVE to do that!!! I would so love to do this. And I will! Someday. Hate to sign up for anything until I know if I will be okay running again. I’m so jealous!! I want to try this but my husband thinks it’s a waste of money!